Forty-four million children worldwide under the age of 12 are overweight or obese. I’m a big believer that reversing that trend and raising children to grow into active, healthy young adults takes a village of parents, caregivers, teachers, coaches, and communities working together to bring about positive change. Meet Josh and Simon. This photo was taken years ago when they were outside playing street hockey. They are now 22 and 18 respectively. 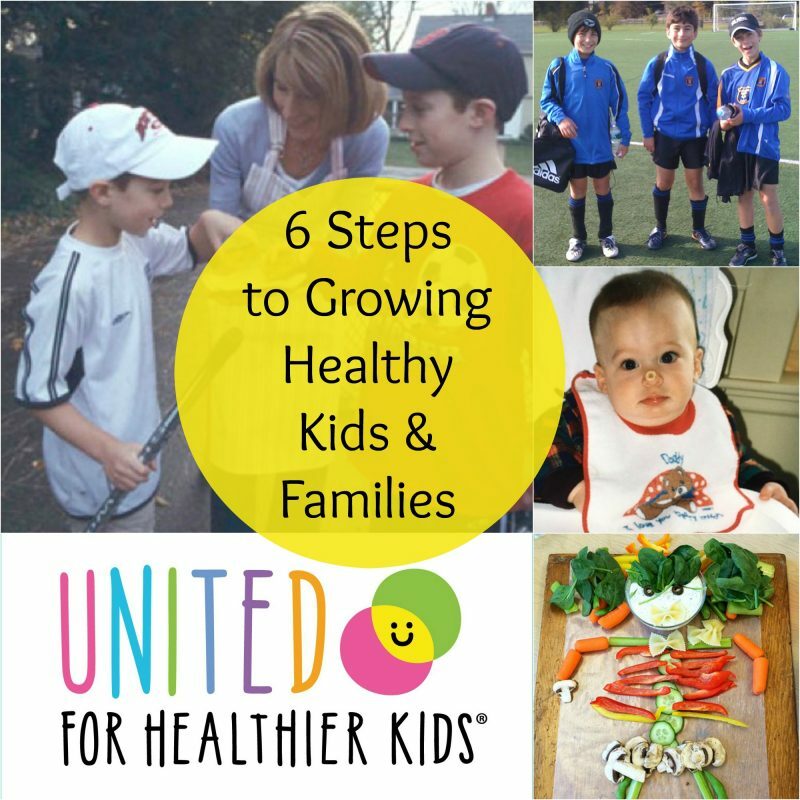 Teaching them how to love and embrace a healthy diet and an active lifestyle took small steps on the part of my husband and me. And I’m happy to report that today, those tiny steps have turned into an actual craving for physical activity as well as vegetables. Simon recently said to me: “Mom, dinner isn’t complete without a vegetable on the side.” I’m not making that up! For my family, managing portions has always meant serving food family style. Providing your children with the opportunity to serve themselves allows for self regulation. 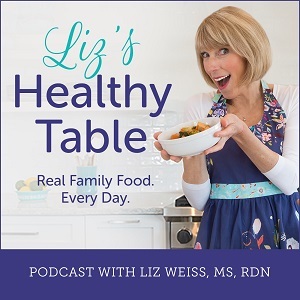 In other words, letting your kids decide how much to eat based on their hunger or fullness cues sets them up for listening to their bodies versus eating what a parent or caregiver places on their plate. That may seem easier said than done, especially when kids are too young to serve themselves. My solution for that was always to start with a small amount of food on the plate and then let my boys ask for more. When Josh and Simon were very young, they used to ask, “can I be done now?” And my response was always, “if your tummy is comfortably full, then of course you can be done. 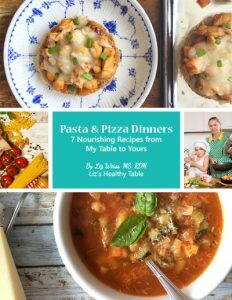 If you’re hungry, feel free to ask for more.” I know it can be difficult, but when parents and caregivers focus on the what and where of mealtime (i.e. roast chicken, broccoli, and brown rice for the what and the kitchen table for the where) and children are empowered with deciding how much they want to eat, then everyone at the table learns to control their own portions. I’ve always believed and experienced firsthand with my own boys that when you offer the choice between two healthy foods—broccoli and carrots, for example—kids tend to choose one if not both options. But if you offer the choice between carrots and cookies, the cookies will often win out. I’m always blown away when I see kids devour vegetables despite the belief that they don’t like anything green. 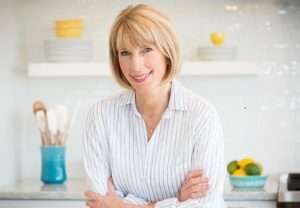 When I teach nutrition classes to kids (or feed my own boys), I like to present an array of fruits and vegetables in creative ways, and I always choose a few things the kids may have never tried before. 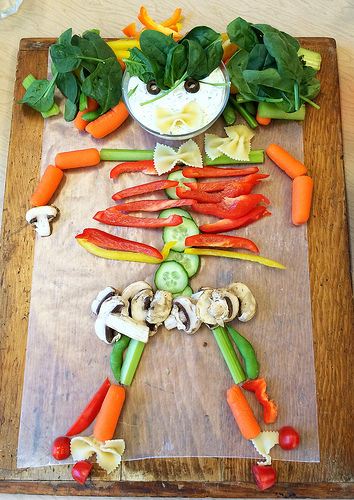 I turn fruits and veggies into shapes: a rainbow, a silly face, and a Halloween skeleton, for example. Serving a nutritious, yogurt-based dip on the side entices kids even more. That’s my kind of kid snack! The earlier you start offering nutritious, varied options the better. 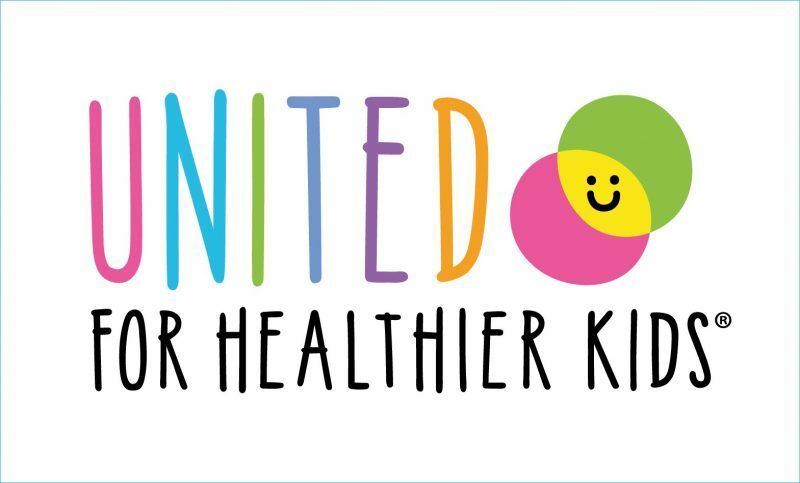 Did you know that by the age of two, a child’s dietary habits become set and stay set throughout early childhood? The World Health Organization (WHO) recommends holding off on the introduction of solid foods until babies are six months old. 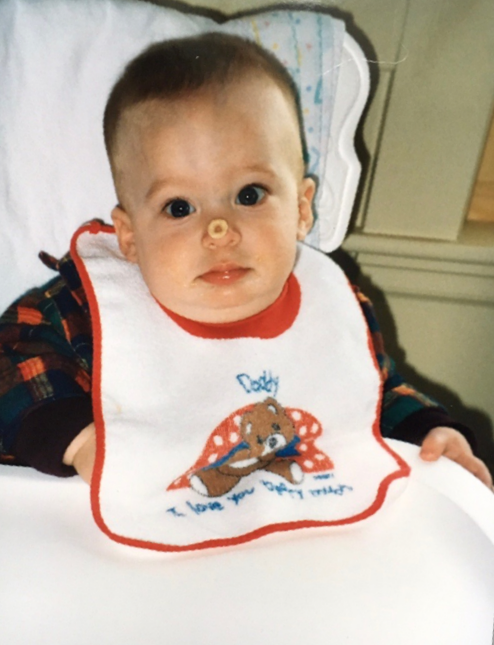 I love this photo of Josh when he was first learning to pick up and eat whole grain cereal. But when I think back to those early feeding days, one memory that always pops into my head was the frustration I felt as a new mom when my boys would throw their food on the floor (or across the room). Mealtime was a science project. It wasn’t that my babies disliked the tiny bits of steamed sweet potato, smashed peas, or banana but rather, that the food was sometimes more fun to toss than to eat. My advice has always been to be pleasantly persistent with solids and to never give up. Experts encourage trying new foods over and over again—8 to 10 times to be exact–because it takes time for babies and toddlers to adapt to new flavors. What’s tossed or rejected one day, might appeal to tiny taste buds the next. Persistence pays off and babies learn to love a more varied diet when they are exposed to a wide array of healthy foods, flavors, and textures. Eating meals together leads to all sorts of health benefits including a healthier body weight and even better grades in school. A big barrier to eating together is distraction. And by distraction I mean things like cell phones, toys, sibling squabbles, and TVs. But how do you shift the focus from chaos at the table to calmness? Well, one strategy that worked wonders for me when Josh and Simon were little was to establish some practical and enforceable mealtime rules. 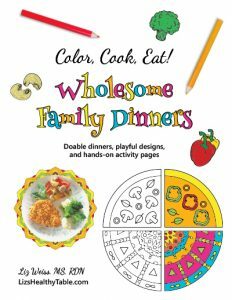 The word “rule” sounds strict and mean, but the mealtime rules I created were realistic, and they were meant to be kind of fun versus really punitive. One rule that always worked wonders was this: “If you diss, you’re dismissed!” What that meant at my table was that if big brother, Josh, said something rude like, “yuck, that food looks gross. I won’t eat it,” he would have to leave the table. 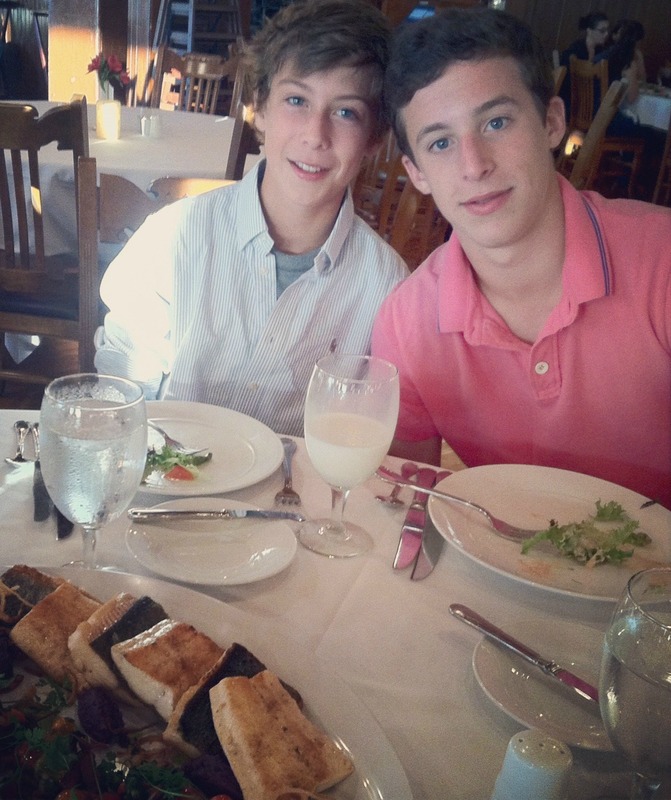 It was always clear at my dinner table that if Josh thought something was gross or yucky and refused to eat it, then his little brother would follow his lead. So I explained to Josh that Simon looked up to him and that if he dissed my meal, Simon would diss it too. To establish peaceful and positive mealtimes, this rule empowered Josh to actually try new foods, because he knew that if he tried something new, then Simon might too. For a little kid, that’s a lot of power. What is your family’s favorite thirst quencher? I’ve worked hard in my home and community to make water the go-to beverage of choice. Water is free, and it’s calorie free too! 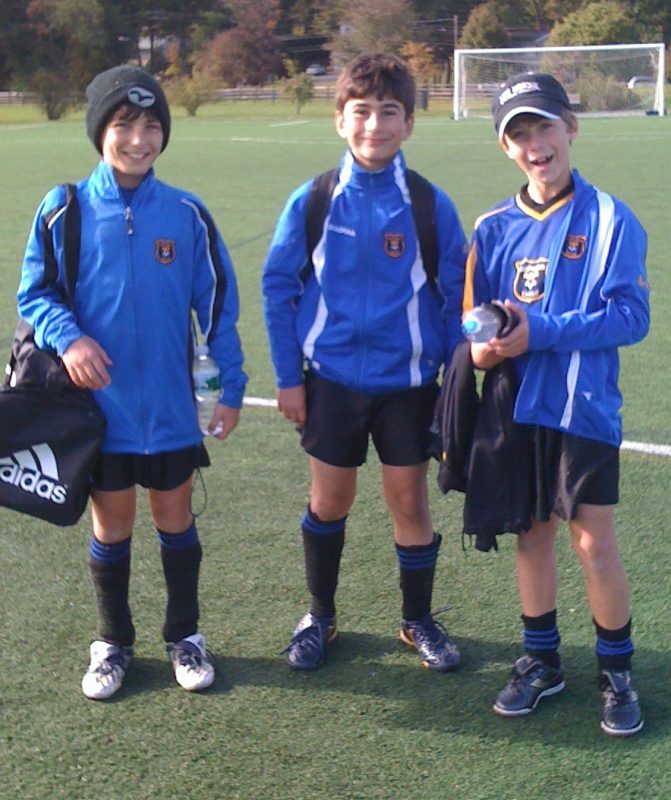 When Josh and Simon started playing town soccer, baseball, and hockey, I always sent them to practices and games with a big, reusable water bottle. Some of their peers would arrive with sports drinks, and when the boys got a little older and parents were tasked with bringing a “team snack” to the games, I also noticed that some of the parents brought sports drinks for everyone. I must admit that this frustrated me a lot. An 8 ounce serving of a popular sports drink, for example, has 3.5 teaspoons of added sugar. Kids just don’t need it, especially here in New England where fall and spring sports are often played in the cold rain. So I worked with our town’s soccer league to implement a Team Snack Guideline, stressing fruit and water only versus sugary and salty snacks and sports drinks. By working with fellow parents, coaches, and the town soccer board, we established a guideline that everyone found easy to implement and follow. The lure of computer screens has a tendency to pull kids away from physical activity. But there are many ways you can encourage your kiddos to move more. Something as simple as setting up a stand-up desk for older kids to use when they do homework to inviting your kids to cook with you in the kitchen, gets them off the couch without nagging or cajoling! With my boys, participating in town sports really helped to keep them moving. Admittedly, late-night hockey practices did not please this mom (kids need their sleep), so switching to sports that were a better fit for our family’s lifestyle was definitely something that helped. It takes a bit of tweaking to get things right. Tell me about your family and the diet and lifestyle activities that have nurtured better health in your homes and communities?